A Hollywood ending would have been sweet for The New Boy at Sandown on Saturday however, it was more important to his connections that he returned home safe. The nine-year-old was racing for the last time and ran his usual honest race to finish sixth behind Orient Line in the seventh race of the day. “He hasn't lost the zest for racing, but his owners decided it was time to retire while he was still competitive and I have no qualms with that,” trainer Danny O'Brien said. "He has been a beauty. Every season since he was two he has turned up, and won, and given all of us a wonderful ride,"
O’Brien purchased The New Boy as a yearling for $75,000 at the Inglis Australian Easter yearling sale in 2010. The son of Rock Of Gibraltar won on debut over 1000m at Cranbourne on April 10, 2011 with Jamie Mott in the saddle and bowed out on Saturday with earnings of $551,355 having finished in the first three 28 times and ridden by 32 jockeys in his 73 starts. Part-owner Matt Worthley made the trip from Adelaide with his family to see The New Boy race for the final time. “He’s been absolutely fantastic to us,” Worthley said. “He’s provided us all with a huge amount of fun. “It all started with a mate of mine Nick Antic who I went to university with and we both enjoyed having a punt. “We roped in his Dad and my Mum and between us we’ve had four horses with Danny and he’s taken us on a fantastic journey. Antic passed away earlier this year due to brain cancer and Worthley said to see The New Boy finish racing was tinged with sorrow. “The New Boy has given his all every time he goes to the track and given us all a huge amount of enjoyment and today is an emotional one,” Worthley said. The New Boy won three times at Flemington as well as races at Caulfield and Morphettville in addition to the Ballan Cup and St Patrick’s Day Cup at Geelong, his last win in March this year. At his second start he was runner-up in the Listed Blue Sapphire Stakes and at three finished second in the Listed Adelaide Guineas. And, although now retired, The New Boy will be back at Flemington again. O'Brien said The New Boy would have a break at his Barwon Heads property before returning to the stable as a lead pony to teach his younger stable mates the rudiments of life as a racehorse. 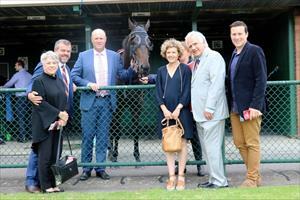 “He’s got such a beautiful nature and has been a stable favourite for some time,” O’Brien said. "He has a home for life with us. He will head out to the paddock with fellow retirees Vigor and Eraset before he starts his new career as the stable pony." Story and Photo by Racenet's Darryl Sherer.